Easily support networked, dual-band operations with reliable performance. With the VX-6000 Mobile Analog Radio, get high output power for greater coverage from 100 W to 120 W adjustable power output. Standard and dual control head packages available. Features 250 channel capacity and the ability to program up to 20 memory groups with no limit on the number of channels in each group. One VX-5500 Control Head and two RF Decks on different bands may be networked for dual-band operation. Low Band, VHF or UHF radios may be combined to meet complex communications requirements for multi-agency operations. As with all Vertex Standard Mobile Analog radios, the VX-5500/6000 Series includes Emergency alert for enhanced driver safety. A panic button can be triggered by the front panel button to alert the dispatcher when problems arise. 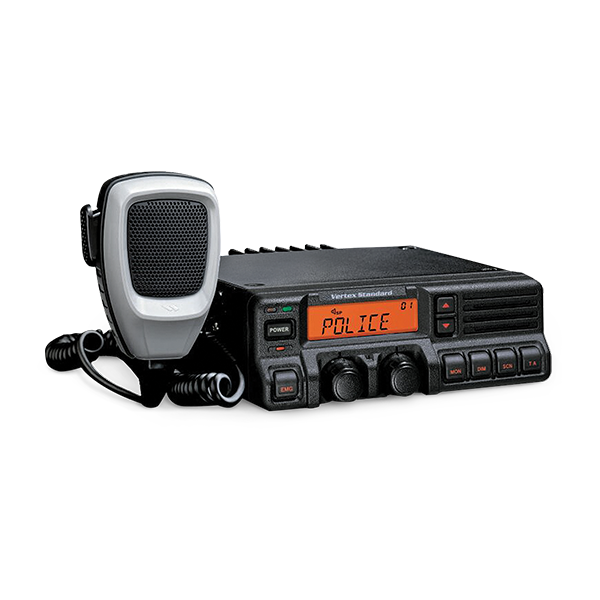 In addition, the VX-5500/6000 Mobile Analog Radio Series features an internal emergency microphone on the front panel so the driver can continue to communicate with dispatch should the regular microphone become unusable. Audio companding ensures full sound for narrow band channel applications. Use the optional 12W rear external speaker for enhanced safety. Always know your connection status. Only Vertex Standard radios are designed to inform you when you and another ARTS-equipped radio are within communication range. If out of range, your radio senses no signal has been received and beeps to alert you. A great solution to keep your workers coordinated.